Admittedly, the had a hill of biases to climb from the start with me. It is a titanium frame lock flipper, a style of knife that I’ve never warmed up to. I find the flipper to be an inferior deployment method for knives, and while I’ve had positive experiences recently with the frame lock, unless it is done exceptionally well it’s temperamental nature make it a sub-optimal lock for daily use. There was also the Mantra’s heritage to consider: it is more or less a retooled Delica 4. I like the Delica as it exists in knife community mythology: an affordable, ideal EDC blade, a true classic that anyone can afford. I enjoy the reality of the Delica much less: strange ergonomics, underwhelming VG-10 steel, and a just-slightly-too-high price point have made it hard for me to connect with this venerable blade. So I picked up the Mantra 1 to see if it could prove itself worthy, both as a titanium framelock flipper, and as a reimagining of the Delica chassis. And there are many ways in which the Mantra is a fine tool. But it has completely bounced off me. The Mantra is a safe design. Too safe. Not every knife needs to be a history-making masterpiece, but nothing about the Mantra’s design excites me. It is purely perfunctory, a competent knife, but a complacent design. Worse, there are things about it that drove me crazy from day one. The longer I carried the Mantra, the more I noticed major problems with its form, its function, and its purpose. Carrying it was never a chore, but it never distinguished itself in use, and now that it’s out of my pocket I can’t imagine why I’d ever carry it again. The Mantra has a handle length of 4”, a blade length of 3 1/8”, and an overall length of 7 ¼” and is made in Taiwan. It weighs 3 oz. As a modified Delica 4, it is a little bigger, and a little heavier. The leaf shape blade is a workhorse. The additional cutting edge length and blade width over a Delica makes a difference when it comes to slicing. The Mantra’s blade is precise and efficient without being overlarge or cumbersome. The ergonomics mess with the cutting control somewhat, but the blade shape itself is pure gold. The steel is my first big issue with the Mantra. I will never disparage CPM-M4’s sheer cutting ability. This is a knife that takes a sharp edge, holds it forever, and is tough, tough, tough. I liked its performance on my Air and I like it here on the Mantra – but when I’m not cutting with M4, I hate it. M4 is not a stainless steel. It discolors, tarnishes, and stains with little provocation, and quite quickly. The minute I got my Mantra I wiped it down with oil, and even so every time I touched the blade my fingers left a mark. I left the Mantra out overnight on my desk in an air-conditioned apartment, and there was discoloration all over the next morning. If the Mantra was designed to be a true everyday user, M4 was a bad choice. I don’t want to have to baby and fret over my EDC knife; it should work well and virtually maintain itself. I feel like Spyderco knows that M4 has a corrosion problem, because the Mantra’s flipper tab, ostensibly the place that will be receiving the most contact from your finger, is differently finished, almost polished, as if to counteract that additional contact – and it still discolors. If Spyderco wanted to go with M4 here, they should have coated or clad it. The sprint run HAP40 Delicas have a laminated blade to fight corrosion, and HAP40 actually has more chromium than M4, so I don’t know why they didn’t work to combat M4’s weaknesses on this more expensive knife. M4 is a great steel for specialized applications, but its quirks preclude it from being an all-purpose folding knife steel. If it was the only steel in the world with great edge retention and toughness, that would be one thing, but we are literally spoiled for choice when it comes to super steels available on $150-200 knives. S35VN is not a ridiculous thing to ask for at $160, and it would have been perfect here. 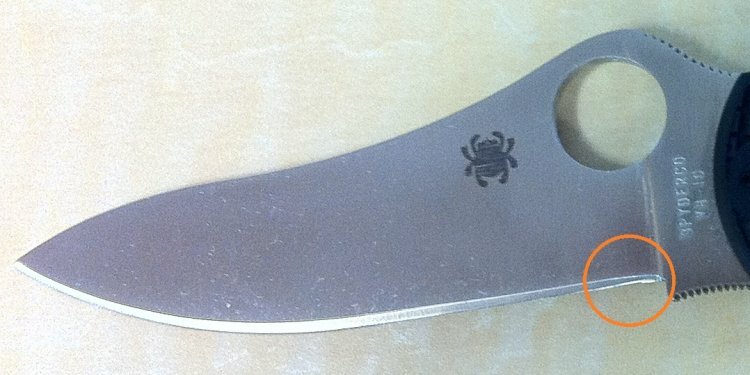 My suspicion is that we are seeing M4 on the Mantra for the same reason that we are still seeing a lot of Spyderco knives with S30V: they have a lot of the stuff lying around and need to get rid of it. But whether it was a matter of convenience or Spyderco really believes in this stuff, it just doesn’t work here.